Before Tinder, there were pie suppers. My affection for the pomp and spectacle of old-timey courting rituals runs deep: I was weaned from birth on the booming male vocals and corn-covered fields of Oklahoma. I swooned over and pined after the rugged, color-coordinated mountain men of Seven Brides for Seven Brothers. They can sing, dance and plow a field? Count me in. While I’ve yet to achieve my dream of singing Bless Your Beautiful Hide while gazing love-drunk into the eyes of a strapping man, the revival of pie supper culture might just provide me with the opportunity. At first blush, the concept of a pie supper seems almost laughably simple: Women from a community prepare their signature pies (from apple butter to chocolate pudding) to be raffled off for charity as a social event. Beginning in the 1900s and continuing in rural hamlets through the mid-1960s, pie suppers provided a way for schools to raise much-needed pocket change for new books and volunteer fire departments to buy proper flame-dousing equipment. “I had a pie supper … made $57.50 and bought books and pictures,” said Stella E. McLain from Higginsville, Missouri in the 1915 Missouri State Teachers Association Bulletin. 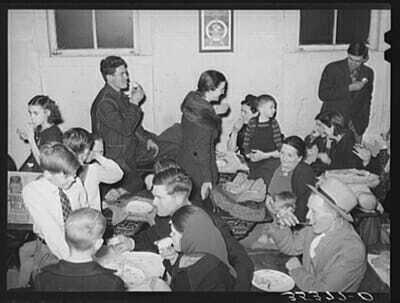 An upcoming pie supper was often the topic of sewing circles and feed store chatter for months prior to the night in question, offering an excuse for farming families – so often spread out and isolated – to gather together, gossip and give back simultaneously. Single men would bid on the eligible ladies’ boxes, and the winner of each box would share the snacks inside with the gal. On closer inspection, though, pie suppers are more than just a form of antiquated altruism, possessing soap opera-levels of nuance and intrigue festering beneath the surface. Pie suppers are a sugary spin-off from the “box socials” popularized in England in the late 1800s, which found their way to America by the turn of the 20th century. The premise of the basic box supper was two-fold. 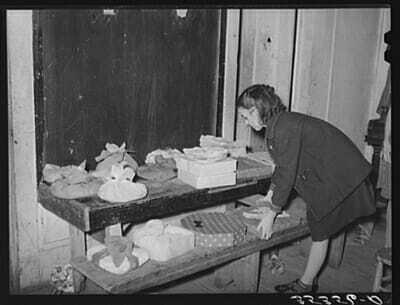 First, women were asked to fill a box (or basket) with enough delectable goodies for two people to share as a lunch, then decorate it with elaborate ribbons, bows and doo-dads. The boxes crafted by “single” and “married” women were separated on two tables. “Married” boxes were primarily an excuse for the spoken-for women to peacock in front of other wives. At the other table, single men would bid on the eligible ladies’ boxes, and the winner of each box would share the snacks inside with the gal who assembled the creation. Box socials (and, eventually, pie suppers) were the ultimate grab-and-go blind date with a feel-good charity kicker. Boxes of pies at pie supper in Muskogee County, Oklahoma. 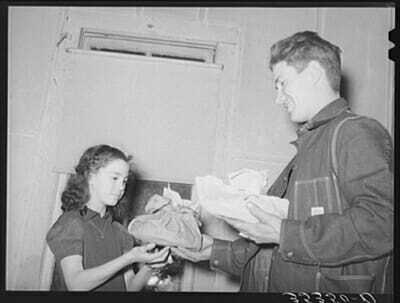 The girl delivered her pie to the person who bid highest in Muskogee County, Oklahoma. 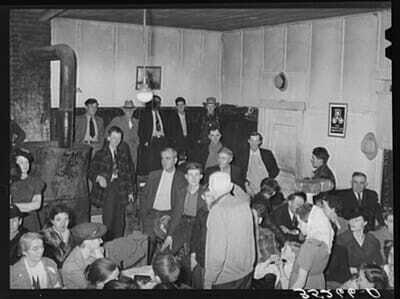 Males gathered for pie auction at the school house in Muskogee County, Oklahoma. Another shot from pie supper in Muskogee County, Oklahoma when everyone was eating pies after the auction ended. 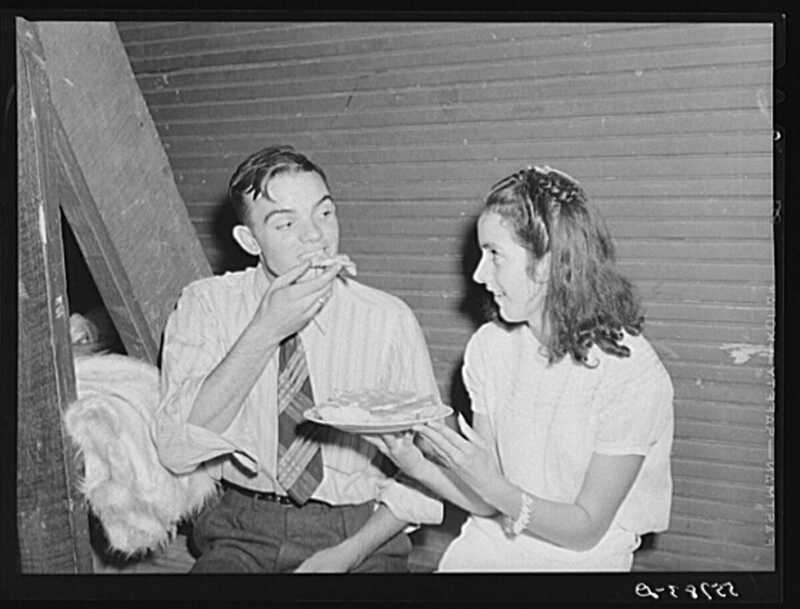 While the fundraiser was the stated goal, pie suppers were ripe with courting rituals: lovelorn boys would try for months to secretly learn which girl crafted which pie, praying for a shot to share a slice with his beloved after successfully bidding on her sugary concoction. Other romance-tinged prizes were often awards to attendees, including a “beauty cake” given to the unwed girl who received the most community votes (although the school teacher frequently took the cake – literally – as a show of good will). Today, it’s not hard to imagine pie suppers coming back into vogue as a playful way to meet that special someone. Better yet, why not swap gender roles in the creation of a 21st century pie supper, with lads crafting their best tarts and galettes for the ladies to fuss over? When the great pie supper resurgence takes place, I’ll be waiting patiently with my caramel apple pie – ready to hobnob with my neighbors, sashay into a line dance and bat my eyes as a prospective beau.